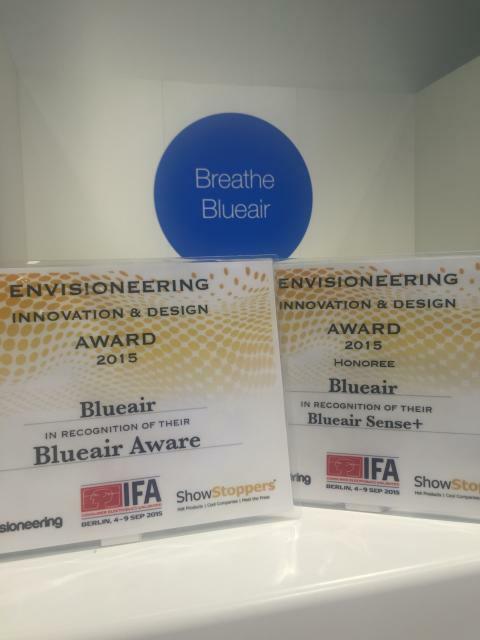 BERLIN, September 9, 2015 – Blueair, a world leader in helping people breathe healthier, cleaner indoor air at home and work, today celebrates winning two Envisioneering Innovation and Design Awards for its breakthrough environmental air purification products. The new Wi-Fi enabled Blueair Sense and Aware Air Quality Monitor were both honored during Showstoppers IFA 2015, the official press event attended by hundreds of journalists at the global tradeshow for consumer electronics and home appliances in Berlin, Germany, in early September. This is the second consecutive year that Blueair has won awards at the IFA Showstoppers event, during which a select group of over 70 companies compete to win recognition for their innovation level, design and value to consumers. Envisioneering's international team of technologists, marketers and industrial designers assessed each product, technology or service before making their choices for the ‘best of the best’ at IFA 2015. Envisioneering is world-renowned for its objective assessment of new technologies, product and services embodiments, and the talents who drive them to market. Envisioneering's analysts are often quoted by print, web and video media for their assessments of "what's next" in technology benefit, fun and value.